It is now Thursday, just after noon. This will likely be my last entry for this trip. Monday night we had leftover lasagne for dinner. It is a great recipe and warms up well. Tuesday was an exciting day for a couple of reasons, but let's tackle food first (one of the reasons). We actually went out to dinner! We and some neighbors drove to Woods Landing for dinner. Woods landing consists of a gas station with store, a bar and a restaurant. Although the restaurant started out as, and now doubles as a dance hall with occasional live entertainment. It was a slow night for the restaurant, but we enjoyed both the idea of "going out" and the food. Lynne had a burger, I had a steak. We started with an appetizer of Rocky Mountain Oysters. All was delicious. 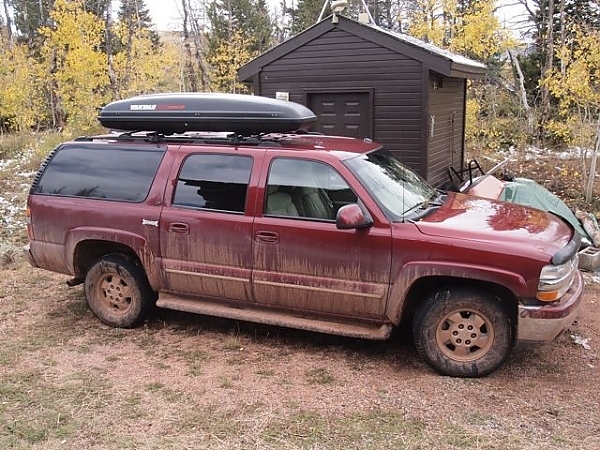 It is about a half-hour drive over dirt (and often muddy roads). Now the truck looks like it belongs in Colorado. 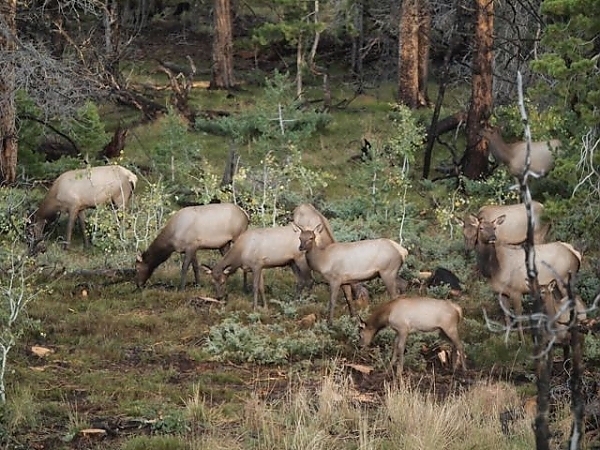 The other exciting news from Tuesday is the herd of elk that came through the meadow. It was early morning, with the sun just creeping into the meadow when Lynne spotted a couple of elk entering the meadow. Soon it was four, then eight, and then obvious a whole herd! 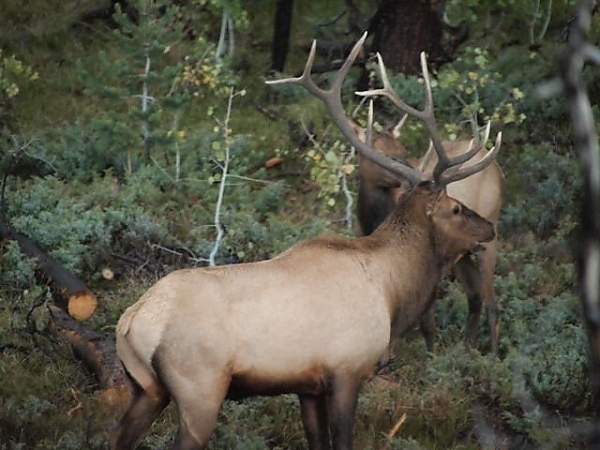 Of course, at this time of year a herd of elk cows probably means a bull is close by. And, sure enough, he showed up, too! Altogether there were probably 35 to 40 elk in the herd. 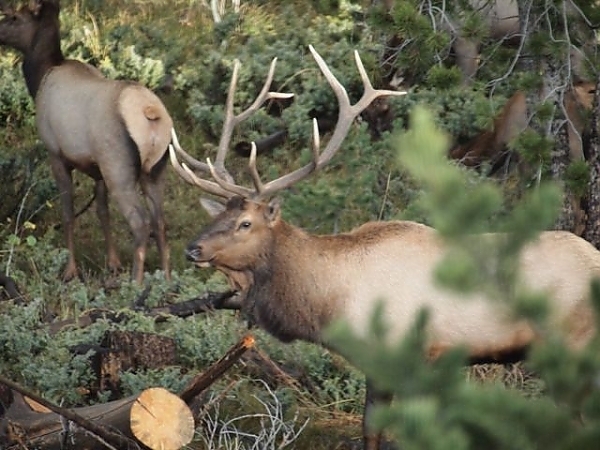 The bull was what is called a Royal Crown elk because he had at least 7 points on each side of his antler rack. Lynne has more photos, including some stunning photos after they left the meadow, on her site. Just click here to see her thorough post. Wednesday morning early we headed into Laramie to do laundry and pick up a few items at the grocery and K-Mart. Lynne also got a pair of awesome dressy cowgirl boots. You can see a photo on her site. It was nice to get all the laundry done. That way we have clean clothes, towels, sheets, etc. the next time we come. We had a burger at MacDonalds, then headed home around noon. We drove through drizzle, then rain, the full-out snow. By the time we got to the cabin the snow was sticking to the ground. We got about 3" total. That was a good excuse to build fires and just be lazy in our cozy cabin. Today is prep day. It is cold and windy outside, so we are not inclined to do much outdoors. Target practice and some additional trail clearing will need to wait till next year. Instead, we've started working down the list of things that need to be done so we can leave early tomorrow morning.